What\'s the need for a symbol? What are the chances of such a platform? Will such an arrangement actually work out? Soon after taking charge of the Janata Dal (United), newly crowned party president Nitish Kumar upped the ante on reviving the Janata Parivar and expanding his reach to other states. And he is also probably looking at a new party symbol. This came amid reports of JD(U), Rashtriya Lok Dal, Jharkhand Vikas Morcha and Samajwadi Janata Party (SJP) merging to take on Bharatiya Janata Party. Report suggests such a front can be called Jan Vikas Party. 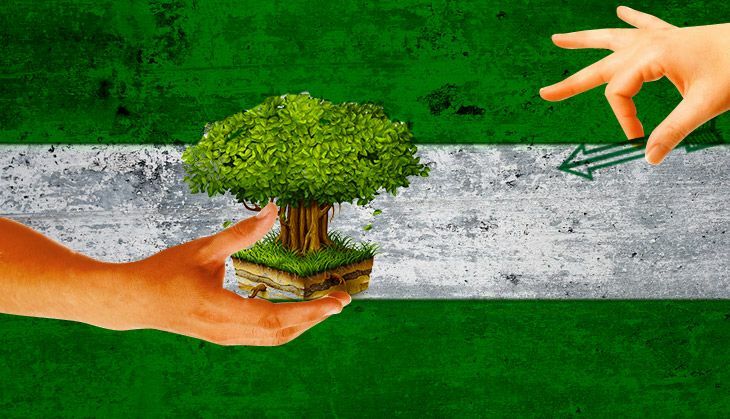 SJP is being wooed by the JD (U) for its election symbol - the banyan tree. The JD(U) leadership believes that its 'arrow' symbol is strikingly similar to that of Shiv Sena and Jharkhand Mukti Morcha and may hurt its prospects in upcoming elections. JD(U) leaders claim Nitish Kumar is also reaching out to other political outfits to stitch together a coalition on the lines of Mahagathbandhan that took on the BJP in Bihar. Even Congress seems to have given its nod for an arrangement with the JD(U) in Uttar Pradesh, which goes to poll next year. The modalities are still being discussed and an announcement is expected to be made soon. On 15 March, Nitish Kumar and Sharad Yadav met Rashtriya Lok Dal (RLD) leaders Ajit Singh, his son Jayant Chaudhary and political strategist Prashant Kishor held a closed-door meeting at KC Tyagi's residence in Delhi. Sources claim that during the meeting it was decided that the merger could happen within a month. However, Kamal Morarka of the SJP is still not sure about the merger and claimed his party workers were not gung ho about the move. "On April 12, we held our national executive meeting and the feedback from party leaders and workers on merger was not that encouraging. We are still holding talks and lets wait for the final decision," Morarka said. Meanwhile, Morarka said Kumar's initiative was certainly laudable and that parties with similar ideology tend to confuse voters which leads to splitting of votes. This he believes benefits the BJP. "Our effort is to consolidate on the basis of ideology. If Congress and CPI (M) can come together, why can't like minded parties like us. After all, the objective is to keep the BJP out of power," he said. Similar sentiments were echoed by Ramesh Dikshit, a political scientist based in Lucknow. According to him, the situation was such that if the intentions of such an outfit are right, people are bound to support it. "Fascist forces are gaining ground in India and people are fed up with BJP's divisionary tactics based on hatred. It is time for like minded parties to come together and take on the BJP," he said. Citing the 1977 General Elections, he said people then voted against the Congress, and this time they would vote for the party that can keep BJP away from UP. "People are not going to vote for Behenji or Bhaiyyaji, they will vote for the front which can take on the BJP. UP elections will test this front and it will only emerge stronger after the results are out," he said. However, similar attempts failed miserably in 2014, when 11 parties came together to take on the Congress and the BJP. Even before the elections, there was a lot of uncertainty on the cohesiveness of such a front and whether it could pose a serious challenge to the BJP. Back then, it was Kumar who was pushing for such a coalition but the lack of consensus over the course of action led to its failure. Nationalist Congress Party leader Tariq Anwar is still sceptical of Kumar's idea of stitching together yet another coalition. "Such a front will not have any sizable impact in the UP elections since the battle is between the BSP, SP and the BJP. Every leader wants to expand his party and Nitish is trying to woo all those with socialist background, but I can't really say what impact it would have in the next elections." He added that it would be premature to speculate on what will happen in 2019. "Three years is a long time in politics and it remains to be seen whether such an initiative would last that long," he said.